The Travelling Companion (1835) is one of our Favorite Fairy Tales, an imaginative and fanciful tale from Hans Christian Andersen . The story traces the trials of Poor John . After his father falls ill and fails to recover, Poor John begins to travel and meets and befriends a mysterious and magical companion who helps him negotiate a deadly courtship with an evil princess. You have been a good son, John, said the sick father, and God will help you on in the world. He looked at him, as he spoke, with mild, earnest eyes, drew a deep sigh, and died; yet it appeared as if he still slept. John wept bitterly. He had no one in the wide world now; neither father, mother, brother, nor sister. Poor John! he knelt down by the bed, kissed his dead fathers hand, and wept many, many bitter tears. But at last his eyes closed, and he fell asleep with his head resting against the hard bedpost. Then he dreamed a strange dream; he thought he saw the sun shining upon him, and his father alive and well, and even heard him laughing as he used to do when he was very happy. A beautiful girl, with a golden crown on her head, and long, shining hair, gave him her hand; and his father said, See what a bride you have won. She is the loveliest maiden on the whole earth. Then he awoke, and all the beautiful things vanished before his eyes, his father lay dead on the bed, and he was all alone. Poor John! During the following week the dead man was buried. The son walked behind the coffin which contained his father, whom he so dearly loved, and would never again behold. He heard the earth fall on the coffin-lid, and watched it till only a corner remained in sight, and at last that also disappeared. He felt as if his heart would break with its weight of sorrow, till those who stood round the grave sang a psalm, and the sweet, holy tones brought tears into his eyes, which relieved him. The sun shone brightly down on the green trees, as if it would say, You must not be so sorrowful, John. Do you see the beautiful blue sky above you? Your father is up there, and he prays to the loving Father of all, that you may do well in the future. I will always be good, said John, and then I shall go to be with my father in heaven. What joy it will be when we see each other again! How much I shall have to relate to him, and how many things he will be able to explain to me of the delights of heaven, and teach me as he once did on earth. Oh, what joy it will be! The little birds in the chestnut-trees twittered, Tweet, tweet; they were so happy, although they had seen the funeral; but they seemed as if they knew that the dead man was now in heaven, and that he had wings much larger and more beautiful than their own; and he was happy now, because he had been good here on earth, and they were glad of it. John saw them fly away out of the green trees into the wide world, and he longed to fly with them; but first he cut out a large wooden cross, to place on his fathers grave; and when he brought it there in the evening, he found the grave decked out with gravel and flowers. Strangers had done this; they who had known the good old father who was now dead, and who had loved him very much. Early the next morning, John packed up his little bundle of clothes, and placed all his money, which consisted of fifty dollars and a few shillings, in his girdle; with this he determined to try his fortune in the world. But first he went into the churchyard; and, by his fathers grave, he offered up a prayer, and said, Farewell. As he passed through the fields, all the flowers looked fresh and beautiful in the warm sunshine, and nodded in the wind, as if they wished to say, Welcome to the green wood, where all is fresh and bright. John continued his journey, and thought of all the wonderful things he should see in the large, beautiful world, till he found himself farther away from home than ever he had been before. He did not even know the names of the places he passed through, and could scarcely understand the language of the people he met, for he was far away, in a strange land. The first night he slept on a haystack, out in the fields, for there was no other bed for him; but it seemed to him so nice and comfortable that even a king need not wish for a better. The field, the brook, the haystack, with the blue sky above, formed a beautiful sleeping-room. The green grass, with the little red and white flowers, was the carpet; the elder-bushes and the hedges of wild roses looked like garlands on the walls; and for a bath he could have the clear, fresh water of the brook; while the rushes bowed their heads to him, to wish him good morning and good evening. The moon, like a large lamp, hung high up in the blue ceiling, and he had no fear of its setting fire to his curtains. John slept here quite safely all night; and when he awoke, the sun was up, and all the little birds were singing round him, Good morning, good morning. Are you not up yet? Outside the church door stood an old beggar, leaning on his crutch. John gave him his silver shillings, and then he continued his journey, feeling lighter and happier than ever. Towards evening, the weather became very stormy, and he hastened on as quickly as he could, to get shelter; but it was quite dark by the time he reached a little lonely church which stood on a hill. I will go in here, he said, and sit down in a corner; for I am quite tired, and want rest. Why do you do this? asked John, when he saw what they were going to do; it is very wicked. Leave him to rest in peace, in Christs name. Nonsense, replied the two dreadful men. He has cheated us; he owed us money which he could not pay, and now he is dead we shall not get a penny; so we mean to have our revenge, and let him lie like a dog outside the church door. I have only fifty dollars, said John, it is all I possess in the world, but I will give it to you if you will promise me faithfully to leave the dead man in peace. I shall be able to get on without the money; I have strong and healthy limbs, and God will always help me. Why, of course, said the horrid men, if you will pay his debt we will both promise not to touch him. You may depend upon that; and then they took the money he offered them, laughed at him for his good nature, and went their way. As John left the wood, a strong mans voice called after him, Hallo, comrade, where are you travelling? Into the wide world, he replied; I am only a poor lad, I have neither father nor mother, but God will help me. I am going into the wide world also, replied the stranger; shall we keep each other company? With all my heart, he said, and so they went on together. Soon they began to like each other very much, for they were both good; but John found out that the stranger was much more clever than himself. He had travelled all over the world, and could describe almost everything. The sun was high in the heavens when they seated themselves under a large tree to eat their breakfast, and at the same moment an old woman came towards them. She was very old and almost bent double. She leaned upon a stick and carried on her back a bundle of firewood, which she had collected in the forest; her apron was tied round it, and John saw three great stems of fern and some willow twigs peeping out. just as she came close up to them, her foot slipped and she fell to the ground screaming loudly; poor old woman, she had broken her leg! 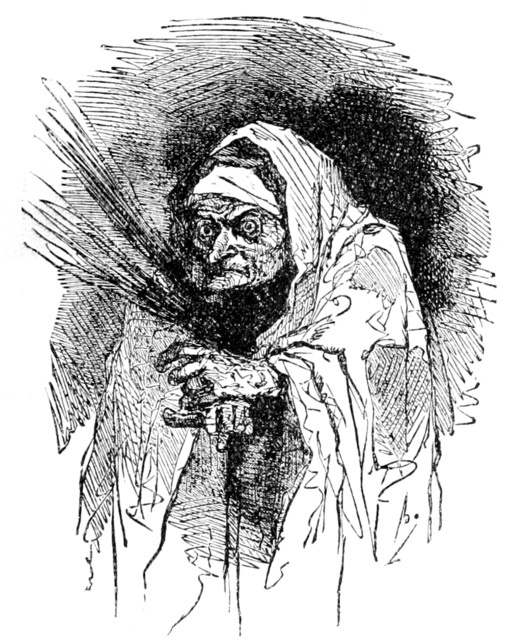 John proposed directly that they should carry the old woman home to her cottage; but the stranger opened his knapsack and took out a box, in which he said he had a salve that would quickly make her leg well and strong again, so that she would be able to walk home herself, as if her leg had never been broken. And all that he would ask in return was the three fern stems which she carried in her apron. That is rather too high a price, said the old woman, nodding her head quite strangely. She did not seem at all inclined to part with the fern stems. However, it was not very agreeable to lie there with a broken leg, so she gave them to him; and such was the power of the ointment, that no sooner had he rubbed her leg with it than the old mother rose up and walked even better than she had done before. But then this wonderful ointment could not be bought at a chemists. What can you want with those three fern rods? asked John of his fellow-traveller. Oh, they will make capital brooms, said he; and I like them because I have strange whims sometimes. Then they walked on together for a long distance. How dark the sky is becoming, said John; and look at those thick, heavy clouds. Those are not clouds, replied his fellow-traveller; they are mountainslarge lofty mountainson the tops of which we should be above the clouds, in the pure, free air. Believe me, it is delightful to ascend so high, tomorrow we shall be there. But the mountains were not so near as they appeared; they had to travel a whole day before they reached them, and pass through black forests and piles of rock as large as a town. The journey had been so fatiguing that John and his fellow-traveller stopped to rest at a roadside inn, so that they might gain strength for their journey on the morrow. In the large public room of the inn a great many persons were assembled to see a comedy performed by dolls. The showman had just erected his little theatre, and the people were sitting round the room to witness the performance. Right in front, in the very best place, sat a stout butcher, with a great bull-dog by his side who seemed very much inclined to bite. He sat staring with all his eyes, and so indeed did every one else in the room. And then the play began. It was a pretty piece, with a king and a queen in it, who sat on a beautiful throne, and had gold crowns on their heads. The trains to their dresses were very long, according to the fashion; while the prettiest of wooden dolls, with glass eyes and large mustaches, stood at the doors, and opened and shut them, that the fresh air might come into the room. It was a very pleasant play, not at all mournful; but just as the queen stood up and walked across the stage, the great bull-dog, who should have been held back by his master, made a spring forward, and caught the queen in the teeth by the slender wrist, so that it snapped in two. This was a very dreadful disaster. The poor man, who was exhibiting the dolls, was much annoyed, and quite sad about his queen; she was the prettiest doll he had, and the bull-dog had broken her head and shoulders off. But after all the people were gone away, the stranger, who came with John, said that he could soon set her to rights. And then he brought out his box and rubbed the doll with some of the salve with which he had cured the old woman when she broke her leg. As soon as this was done the dolls back became quite right again; her head and shoulders were fixed on, and she could even move her limbs herself: there was now no occasion to pull the wires, for the doll acted just like a living creature, excepting that she could not speak. The man to whom the show belonged was quite delighted at having a doll who could dance of herself without being pulled by the wires; none of the other dolls could do this. During the night, when all the people at the inn were gone to bed, some one was heard to sigh so deeply and painfully, and the sighing continued for so long a time, that every one got up to see what could be the matter. The showman went at once to his little theatre and found that it proceeded from the dolls, who all lay on the floor sighing piteously, and staring with their glass eyes; they all wanted to be rubbed with the ointment, so that, like the queen, they might be able to move of themselves. The queen threw herself on her knees, took off her beautiful crown, and, holding it in her hand, cried, Take this from me, but do rub my husband and his courtiers. The poor man who owned the theatre could scarcely refrain from weeping; he was so sorry that he could not help them. Then he immediately spoke to John's comrade, and promised him all the money he might receive at the next evenings performance, if he would only rub the ointment on four or five of his dolls. But the fellow-traveller said he did not require anything in return, excepting the sword which the showman wore by his side. As soon as he received the sword he anointed six of the dolls with the ointment, and they were able immediately to dance so gracefully that all the living girls in the room could not help joining in the dance. The coachman danced with the cook, and the waiters with the chambermaids, and all the strangers joined; even the tongs and the fire-shovel made an attempt, but they fell down after the first jump. So after all it was a very merry night. The next morning John and his companion left the inn to continue their journey through the great pine-forests and over the high mountains. They arrived at last at such a great height that towns and villages lay beneath them, and the church steeples looked like little specks between the green trees. They could see for miles round, far away to places they had never visited, and John saw more of the beautiful world than he had ever known before. The sun shone brightly in the blue firmament above, and through the clear mountain air came the sound of the huntsmans horn, and the soft, sweet notes brought tears into his eyes, and he could not help exclaiming, How good and loving God is to give us all this beauty and loveliness in the world to make us happy! His fellow-traveller stood by with folded hands, gazing on the dark wood and the towns bathed in the warm sunshine. At this moment there sounded over their heads sweet music. They looked up, and discovered a large white swan hovering in the air, and singing as never bird sang before. But the song soon became weaker and weaker, the birds head drooped, and he sunk slowly down, and lay dead at their feet. It is a beautiful bird, said the traveller, and these large white wings are worth a great deal of money. I will take them with me. You see now that a sword will be very useful. They now continued their journey over the mountains for many miles, till they at length reached a large city, containing hundreds of towers, that shone in the sunshine like silver. In the midst of the city stood a splendid marble palace, roofed with pure red gold, in which dwelt the king. John and his companion would not go into the town immediately; so they stopped at an inn outside the town, to change their clothes; for they wished to appear respectable as they walked through the streets. The landlord told them that the king was a very good man, who never injured any one: but as to his daughter, Heaven defend us! She was indeed a wicked princess. She possessed beauty enough nobody could be more elegant or prettier than she was; but what of that? for she was a wicked witch; and in consequence of her conduct many noble young princes had lost their lives. Any one was at liberty to make her an offer; were he a prince or a beggar, it mattered not to her. She would ask him to guess three things which she had just thought of, and if he succeed, he was to marry her, and be king over all the land when her father died; but if he could not guess these three things, then she ordered him to be hanged or to have his head cut off. The old king, her father, was very much grieved at her conduct, but he could not prevent her from being so wicked, because he once said he would have nothing more to do with her lovers; she might do as she pleased. Each prince who came and tried the three guesses, so that he might marry the princess, had been unable to find them out, and had been hanged or beheaded. They had all been warned in time, and might have left her alone, if they would. The old king became at last so distressed at all these dreadful circumstances, that for a whole day every year he and his soldiers knelt and prayed that the princess might become good; but she continued as wicked as ever. The old women who drank brandy would color it quite black before they drank it, to show how they mourned; and what more could they do? What a horrible princess! said John; she ought to be well flogged. If I were the old king, I would have her punished in some way. Just then they heard the people outside shouting, Hurrah! and, looking out, they saw the princess passing by; and she was really so beautiful that everybody forgot her wickedness, and shouted Hurrah! Twelve lovely maidens in white silk dresses, holding golden tulips in their hands, rode by her side on coal-black horses. The princess herself had a snow-white steed, decked with diamonds and rubies. Her dress was of cloth of gold, and the whip she held in her hand looked like a sunbeam. The golden crown on her head glittered like the stars of heaven, and her mantle was formed of thousands of butterflies wings sewn together. Yet she herself was more beautiful than all. It could not be true, he thought, that she was really a wicked witch, who ordered people to be hanged or beheaded, if they could not guess her thoughts. Every one has permission to go and ask her hand, even the poorest beggar. I shall pay a visit to the palace, he said; I must go, for I cannot help myself. Come in, said the king, as John knocked at the door. John opened it, and the old king, in a dressing gown and embroidered slippers, came towards him. He had the crown on his head, carried his sceptre in one hand, and the orb in the other. Wait a bit, said he, and he placed the orb under his arm, so that he could offer the other hand to John; but when he found that John was another suitor, he began to weep so violently, that both the sceptre and the orb fell to the floor, and he was obliged to wipe his eyes with his dressing gown. Poor old king! Let her alone, he said; you will fare as badly as all the others. Come, I will show you. Then he led him out into the princess's pleasure gardens, and there he saw a frightful sight. On every tree hung three or four kings sons who had wooed the princess, but had not been able to guess the riddles she gave them. Their skeletons rattled in every breeze, so that the terrified birds never dared to venture into the garden. All the flowers were supported by human bones instead of sticks, and human skulls in the flower-pots grinned horribly. It was really a doleful garden for a princess. Do you see all this? said the old king; your fate will be the same as those who are here, therefore do not attempt it. You really make me very unhappy,I take these things to heart so very much. John kissed the good old kings hand, and said he was sure it would be all right, for he was quite enchanted with the beautiful princess. Then the princess herself came riding into the palace yard with all her ladies, and he wished her Good morning. She looked wonderfully fair and lovely when she offered her hand to John, and he loved her more than ever. How could she be a wicked witch, as all the people asserted? He accompanied her into the hall, and the little pages offered them gingerbread nuts and sweetmeats, but the old king was so unhappy he could eat nothing, and besides, gingerbread nuts were too hard for him. It was decided that John should come to the palace the next day, when the judges and the whole of the counsellors would be present, to try if he could guess the first riddle. If he succeeded, he would have to come a second time; but if not, he would lose his life, and no one had ever been able to guess even one. However, John was not at all anxious about the result of his trial; on the contrary, he was very merry. He thought only of the beautiful princess, and believed that in some way he should have help, but how he knew not, and did not like to think about it; so he danced along the high-road as he went back to the inn, where he had left his fellow-traveller waiting for him. John could not refrain from telling him how gracious the princess had been, and how beautiful she looked. He longed for the next day so much, that he might go to the palace and try his luck at guessing the riddles. But his comrade shook his head, and looked very mournful. I do so wish you to do well, said he; we might have continued together much longer, and now I am likely to lose you; you poor dear John! I could shed tears, but I will not make you unhappy on the last night we may be together. We will be merry, really merry this evening; to-morrow, after you are gone, shall be able to weep undisturbed. In the evening John's comrade prepared a large bowl of punch, and said, Now let us be merry, and drink to the health of the princess. But after drinking two glasses, John became so sleepy, that he could not keep his eyes open, and fell fast asleep. Then his fellow-traveller lifted him gently out of his chair, and laid him on the bed; and as soon as it was quite dark, he took the two large wings which he had cut from the dead swan, and tied them firmly to his own shoulders. Then he put into his pocket the largest of the three rods which he had obtained from the old woman who had fallen and broken her leg. After this he opened the window, and flew away over the town, straight towards the palace, and seated himself in a corner, under the window which looked into the bedroom of the princess. The town was perfectly still when the clocks struck a quarter to twelve. Presently the window opened, and the princess, who had large black wings to her shoulders, and a long white mantle, flew away over the city towards a high mountain. The fellow-traveller, who had made himself invisible, so that she could not possibly see him, flew after her through the air, and whipped the princess with his rod, so that the blood came whenever he struck her. Ah, it was a strange flight through the air! The wind caught her mantle, so that it spread out on all sides, like the large sail of a ship, and the moon shone through it. How it hails, to be sure! said the princess, at each blow she received from the rod; and it served her right to be whipped. At last she reached the side of the mountain, and knocked. The mountain opened with a noise like the roll of thunder, and the princess went in. The traveller followed her; no one could see him, as he had made himself invisible. They went through a long, wide passage. A thousand gleaming spiders ran here and there on the walls, causing them to glitter as if they were illuminated with fire. They next entered a large hall built of silver and gold. Large red and blue flowers shone on the walls, looking like sunflowers in size, but no one could dare to pluck them, for the stems were hideous poisonous snakes, and the flowers were flames of fire, darting out of their jaws. Shining glow-worms covered the ceiling, and sky-blue bats flapped their transparent wings. Altogether the place had a frightful appearance. In the middle of the floor stood a throne supported by four skeleton horses, whose harness had been made by fiery-red spiders. The throne itself was made of milk-white glass, and the cushions were little black mice, each biting the others tail. Over it hung a canopy of rose-colored spiders webs, spotted with the prettiest little green flies, which sparkled like precious stones. On the throne sat an old magician with a crown on his ugly head, and a sceptre in his hand. He kissed the princess on the forehead, seated her by his side on the splendid throne, and then the music commenced. Great black grasshoppers played the mouth organ, and the owl struck herself on the body instead of a drum. It was altogether a ridiculous concert. Little black goblins with false lights in their caps danced about the hall; but no one could see the traveller, and he had placed himself just behind the throne where he could see and hear everything. The courtiers who came in afterwards looked noble and grand; but any one with common sense could see what they really were, only broomsticks, with cabbages for heads. The magician had given them life, and dressed them in embroidered robes. It answered very well, as they were only wanted for show. After there had been a little dancing, the princess told the magician that she had a new suitor, and asked him what she could think of for the suitor to guess when he came to the castle the next morning. Listen to what I say, said the magician, you must choose something very easy, he is less likely to guess it then. Think of one of your shoes, he will never imagine it is that. Then cut his head off; and mind you do not forget to bring his eyes with you to-morrow night, that I may eat them. I may as well say that as anything, said John. Perhaps your dream may come true; still I will say farewell, for if I guess wrong I shall never see you again. Then they embraced each other, and John went into the town and walked to the palace. The great hall was full of people, and the judges sat in arm-chairs, with eider-down cushions to rest their heads upon, because they had so much to think of. The old king stood near, wiping his eyes with his white pocket-handkerchief. When the princess entered, she looked even more beautiful than she had appeared the day before, and greeted every one present most gracefully; but to John she gave her hand, and said, Good morning to you. Now came the time for John to guess what she was thinking of; and oh, how kindly she looked at him as she spoke. But when he uttered the single word shoe, she turned as pale as a ghost; all her wisdom could not help her, for he had guessed rightly. Oh, how pleased the old king was! It was quite amusing to see how he capered about. All the people clapped their hands, both on his account and John's, who had guessed rightly the first time. His fellow-traveller was glad also, when he heard how successful John had been. But John folded his hands, and thanked God, who, he felt quite sure, would help him again; and he knew he had to guess twice more. The evening passed pleasantly like the one preceding. While John slept, his companion flew behind the princess to the mountain, and flogged her even harder than before; this time he had taken two rods with him. No one saw him go in with her, and he heard all that was said. The princess this time was to think of a glove, and he told John as if he had again heard it in a dream. The next day, therefore, he was able to guess correctly the second time, and it caused great rejoicing at the palace. The whole court jumped about as they had seen the king do the day before, but the princess lay on the sofa, and would not say a single word. All now depended upon John. If he only guessed rightly the third time, he would marry the princess, and reign over the kingdom after the death of the old king: but if he failed, he would lose his life, and the magician would have his beautiful blue eyes. That evening John said his prayers and went to bed very early, and soon fell asleep calmly. But his companion tied on his wings to his shoulders, took three rods, and, with his sword at his side, flew to the palace. It was a very dark night, and so stormy that the tiles flew from the roofs of the houses, and the trees in the garden upon which the skeletons hung bent themselves like reeds before the wind. The lightning flashed, and the thunder rolled in one long-continued peal all night. The window of the castle opened, and the princess flew out. She was pale as death, but she laughed at the storm as if it were not bad enough. Her white mantle fluttered in the wind like a large sail, and the traveller flogged her with the three rods till the blood trickled down, and at last she could scarcely fly; she contrived, however, to reach the mountain. What a hail-storm! she said, as she entered; I have never been out in such weather as this. Yes, there may be too much of a good thing sometimes, said the magician. Then the princess told him that John had guessed rightly the second time, and if he succeeded the next morning, he would win, and she could never come to the mountain again, or practice magic as she had done, and therefore she was quite unhappy. I will find out something for you to think of which he will never guess, unless he is a greater conjuror than myself. But now let us be merry. Then he took the princess by both hands, and they danced with all the little goblins and Jack-o-lanterns in the room. The red spiders sprang here and there on the walls quite as merrily, and the flowers of fire appeared as if they were throwing out sparks. The owl beat the drum, the crickets whistled and the grasshoppers played the mouth-organ. It was a very ridiculous ball. After they had danced enough, the princess was obliged to go home, for fear she should be missed at the palace. The magician offered to go with her, that they might be company to each other on the way. Then they flew away through the bad weather, and the traveller followed them, and broke his three rods across their shoulders. The magician had never been out in such a hail-storm as this. Just by the palace the magician stopped to wish the princess farewell, and to whisper in her ear, To-morrow think of my head. 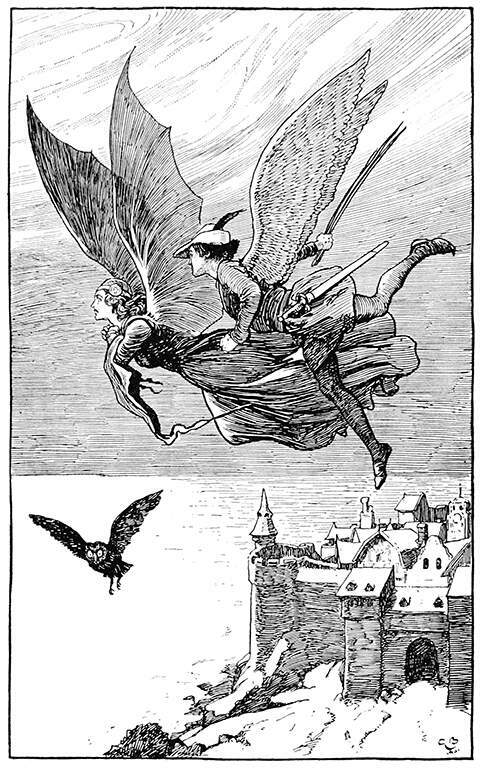 But the traveller heard it, and just as the princess slipped through the window into her bedroom, and the magician turned round to fly back to the mountain, he seized him by the long black beard, and with his sabre cut off the wicked conjurors head just behind the shoulders, so that he could not even see who it was. He threw the body into the sea to the fishes, and after dipping the head into the water, he tied it up in a silk handkerchief, took it with him to the inn, and then went to bed. The next morning he gave John the handkerchief, and told him not to untie it till the princess asked him what she was thinking of. There were so many people in the great hall of the palace that they stood as thick as radishes tied together in a bundle. The council sat in their arm-chairs with the white cushions. The old king wore new robes, and the golden crown and sceptre had been polished up so that he looked quite smart. But the princess was very pale, and wore a black dress as if she were going to a funeral. What have I thought of? asked the princess, of John. He immediately untied the handkerchief, and was himself quite frightened when he saw the head of the ugly magician. Every one shuddered, for it was terrible to look at; but the princess sat like a statue, and could not utter a single word. At length she rose and gave John her hand, for he had guessed rightly. She looked at no one, but sighed deeply, and said, You are my master now; this evening our marriage must take place. I am very pleased to hear it, said the old king. It is just what I wish. Till the sole falls from your shoe. But the princess was still a witch, and she could not love John. His fellow-traveller had thought of that, so he gave John three feathers out of the swans wings, and a little bottle with a few drops in it. He told him to place a large bath full of water by the princess's bed, and put the feathers and the drops into it. Then, at the moment she was about to get into bed, he must give her a little push, so that she might fall into the water, and then dip her three times. This would destroy the power of the magician, and she would love him very much. John did all that his companion told him to do. The princess shrieked aloud when he dipped her under the water the first time, and struggled under his hands in the form of a great black swan with fiery eyes. As she rose the second time from the water, the swan had become white, with a black ring round its neck. John allowed the water to close once more over the bird, and at the same time it changed into a most beautiful princess. She was more lovely even than before, and thanked him, while her eyes sparkled with tears, for having broken the spell of the magician. The next day, the king came with the whole court to offer their congratulations, and stayed till quite late. Last of all came the travelling companion; he had his staff in his hand and his knapsack on his back. John kissed him many times and told him he must not go, he must remain with him, for he was the cause of all his good fortune. But the traveller shook his head, and said gently and kindly, No: my time is up now; I have only paid my debt to you. Do you remember the dead man whom the bad people wished to throw out of his coffin? You gave all you possessed that he might rest in his grave; I am that man. As he said this, he vanished. Enjoy our complete collection of Short Stories for Children and Fairy Tales Guide. Add The Travelling Companion to your own personal library.